In addition to receiving 7-day wind and swell forecasts, Buoyweather Premium members also have access to several other detailed forecasting charts and graphs that can be found under "Location Forecasts" in the left menu. Sign up today to use these tools so you can be as prepared as possible before setting off on your next voyage. 7 Day Graph V2 - The Version 2 wind and swell graph shows the 7-day forecast with the swell charts color-coded by wave period. 7 Day Graph - This is the standard Buoyweather 7-day wind and swell forecast. Premium members get 7 full days instead of just 2 days. 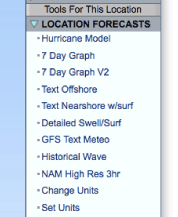 Text Nearshore w/surf - This is a text forecast that combines wind data with swell direction, height, and period. Text Offshore - This is the 7-day forecast in a text format. NAM High Res 3hr - Although the NAM (North American Mesoscale Model) isn't available on a global level, when available, it provides the highest resolution 2 1/2 day forecast at a 3 hour interval. Use this model for highly accurate short term wind and swell forecasts. Hurricane Model - This is the best available forecast model when trying to properly predict wind and swell conditions resulting from a hurricane or cyclone. By blending two wind models, the Hurricane model more accurately predicts the wind speeds that are typically found tightly packed near the eye of the storm. Use this model for high accuracy forecasts during periods of tropical storm activity. Historical Wave - This allows the you to research wave data from the last 14 years. The Historical Wave model is commonly used for investigating marine accidents or damage, choosing the ideal time of year for vacations, and comparing current forecasts with previous events to refine outlooks. GFS Text Meteo - This is a text forecast that is produced by the GFS (Global Forecasting System) model. This global model is at a 27- kilometer resolution level. Detailed Swell/Surf - This model breaks down individual swells by direction, height, period, and size. Get the most out of Buoyweather's forecasting. Use the Locations menu to the left above to access the all the forecast tools for your location today!